A report I share each month of the progress to my wealth building portfolio of stocks and mutual fund position added with reasons and contract notes to remain fully transparent. I also share the important lessons I learn along with the plans for the upcoming month. In February, I invested majorly in Tata Steel, very little in Infosys and rest in Birla Sun Life Tax Plan mutual fund. In the month of Feb, my plan was to mostly invest in Tax saving ELSS fund but market gave such a great opportunity in Tata Steel that I decided to delay tax saving investment. 11 Feb 2016 when Sensex was down by 800 pts and Nifty by almost 250 I purchased metal sector Tata Steel in the closing hour of trade. Contract notes here. If you would like to read the technicals and fundamentals of why I preferred Tata Steel, you can check my February 2016 portfolio update. Metal sector gloom and doom is known to everybody in market but in one month Tata Steel has given me a return of 30%. Though it feels good as far as performance of portfolio is, I would have prefer Tata steel to not run so much and provide me more opportunities to invest more in this stock at lower levels of under 250 but above 200 support zone in next few months. I will keep a keen eye on it and hope it corrects in the results season the where result is expected to be subdued and hope Tata Steel to remain in correction mode for the next quarter or so where we could invest more. Correction in Infosys has never been too sharp and so is the up move and so it is one of those stock that you should always be accumulating and I added yet another 5 units of Infosys on 7th Feb 2016 to my wealth building portfolio. Contract notes here. Again the fundamentals and technicals of Infosys are shared in my February 2016 portfolio update. In Feb I wanted to invest majorly in Tax Saving ELSS Scheme but market unfolded in such a manner that I had to make choice of investing in Tata Steel at 230ish levels which was above the major support levels of 200 or investing in index based ELSS mutual fund with Nifty forming a lower top lower bottom Since it touched 9100 and was cracking all support levels and formed a new low of 6869. The obvious choice was Tata Steel. 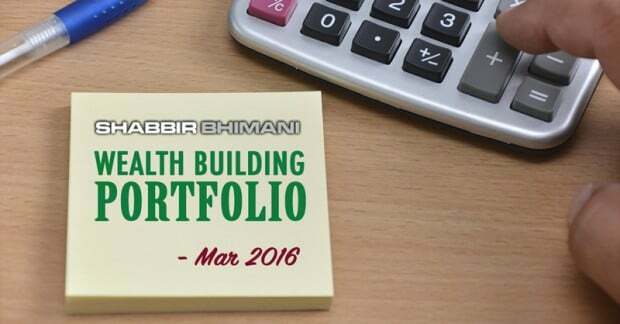 Still I allocated 40% or Rs 20,000 of my total investment in Feb to an ELSS mutual fund. As always, I prefer to invest in dividend heavy fund to save Tax so I can invest less and get full tax savings. I opted for Birla Sun Life tax Plan as they have been giving very good dividends and performance of the fund is great as well. Order details here. Performance of portfolio we have built so far. It was wait and watch in the last month and I continue to hold the same view. It has formed a good support at above 600 which is also a long term support but I would like to see it being tested more than once and holding before accumulating more into it. I am accumulating Infosys slowly but I invested too early in Infosys in the month of Feb and could have managed better price if I could have remained more systematic in my approach. It has been a roller coaster ride in the market where we have seen Nifty touching 6825 and 7506 in the same week. The runup in the market was so quick that I decided to remain cautious. I plan to invest in ELSS tax saving mutual funds and there will be very less choice of delaying my investment in March. 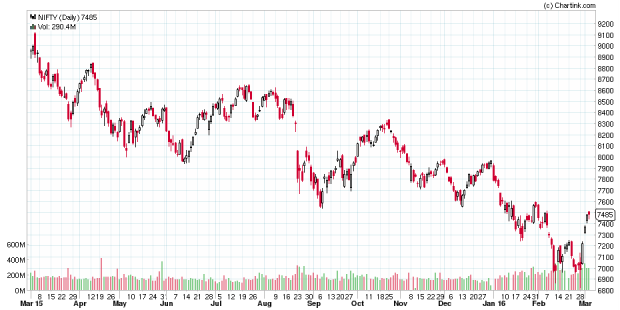 So a moderate correction in market from 7500 Nifty levels and I will invest in Birla SL Tax Plan.